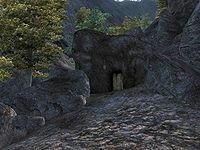 Doomed Mine is a small mine southeast of Cheydinhal containing bandits. It contains only one zone, Doomed Mine. This mine contains 3 Wisp Stalk plants. 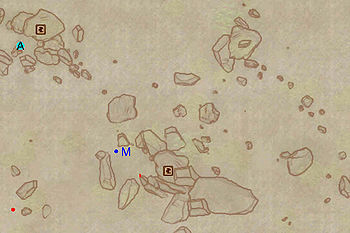 This location's map marker (M on map) is named Doomed Mine (editor name DoomedMineMapMarker). The entrance door is ESE of the marker, 70 feet away. Doomed Mine is a fairly unremarkable mine and the most valuable items are the ones worn by the inhabitants. Make your way to the first larger room and clear out the opposition and loot the chest. After finishing this, head south and loot the locked chest on the way through the tunnel. The last room in this tunnel is a bandit campsite, complete with a bedroll, at b, cheap wine and the expected opposition. 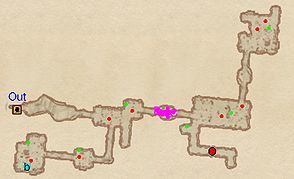 After looting the slain bandits and the chest, backtrack to the large room and proceed east where you will find a room filled to the brink with traps; 10 Pressure Plate triggers (C) and 5 Swinging Mace traps (D). 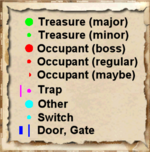 In the next large room, head south for a possible encounter with an Orc Adventurer at O and a chest with minor loot. Proceed north and clear the last room of enemies and loot the locked chest. When all is said and done, exit the mine the way you came, through door Out.